It is seldom to reach the pinnacle of your profession. Whether it be in the fast food industry, retail, the medical field or in this case sports journalism. Reaching the top or even getting near it for that matter is a difficult feat. For Crystina Poncher however she has managed to navigate through those muddy waters with style and grace. Crystina currently is a host and reporter for the NFL. That alone would make anyone proud and satisfied. For Crystina however that wasn’t enough. 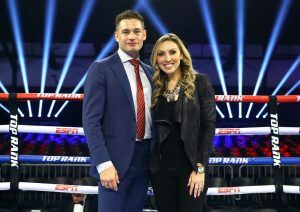 She has also taken her talents to the world of boxing as she is a reporter and commentator for Top Rank. Let’s be honest here. Becoming a sports reporter and commentator is a difficult career path to take. It can be frustrating trying to find a great opportunity. That difficulty did not discourage her in the slightest as she has always dreamed of becoming a sports reporter. “I knew from 13 years old that I wanted to be a sports reporter. I quit my job full time and just jumped into boxing.” Said Crystina. Often times young kids dream of what they want to become. That however is the easy part. Actually going out and accomplishing it is where the difficulty lies. There is also a major elephant in the room, she is a woman. Boxing is a sport that has a scarcity in terms of women who report on it. When she first came on to the boxing scene, some of the biggest names in the sport were taken a back by it. Forget about her being a woman. She is simply an outstanding reporter. For Crystina she has earned the respect of all of her peers for the hard work that she has put in over the years. “She’s not just a good female broadcaster but she is a good broadcaster. A great broadcaster. And I really appreciate her being a forerunner in terms of women getting behind the mic and blazing a new path for women to be able to sit in the same seat that she is sitting in.” Said now retired pound for pound king Andre Ward. This is much deeper then just following your dreams. This is also about setting a new standard for women all around the world that are hesitant to fully commit to the dreams that they deem is to lofty. Crystina understands the type of pressure that comes with her position. Not only is she not backing away from it but she is embracing it and taking it head on. If you think that Crystina can only inspire women than you are flat out wrong. Men can learn a thing or two from her as well. Her dedication, passion and never give up attitude is commendable and should be respected by everyone no matter the gender. There is no doubt that she will continue to do an outstanding job because she works tirelessly at her craft. Everyone can see the work that she has put in to get to this stage. Sure she has reached the mountain of her profession but if you think the work is now over then you are sadly mistaken. For Crystina Poncher this is only the beginning.